7 Players came out last night, and several players had tried to talk Waffles into playing, but it didnt happen. No changes at the top of the 2009 leaderboard, but a lot of fun, and some discussion of other games to be brought into the rotation. I am going to attempt to add a 7-Game (HORSE + 2-7 Triple Draw + ?? ), and may try a Holiday timed $1 Pot Limit High Omaha Rebuy in December. Will have next weeks game posted soon, need to check to see if any games are left, or if I need to email and add the new selections! Tonight is Limit HORSE. Always fun to build a stack in the H and O portions, just to lose it all back in the R, S and E.
A very nice 14 players came out on Tuesday night for the Skillz Game, except only 13 of them played. While I had signed up on Monday, I was sick Monday until Wednesday, and I never logged in to play. 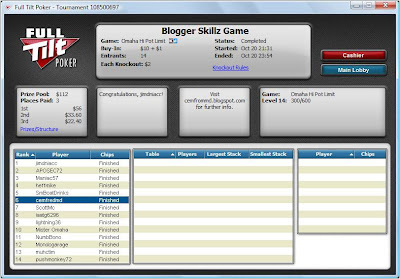 Which may have been the best move I have made in Poker in a month, as I finished 6th of 14 having never played a hand! Thank you to all of you who turned out, and for your patience in getting the blog updated. Next week is Limit HORSE. I will be there, just push on me in Razz and you should have me out fairly quickly. Images are not coming up right now for me, but pretend the the Skillz game image is here. Pot Limit Omaha Hi tonight. Hope to see you all here tonight! Stud Hi/Lo is always fun, hope we get a lot of people out there. I lost a lot of my data from my IPod about my Live Poker touranments, but have been able to write down much of what I remember, so later this week I will update you guys on that too. I know, an update that doesnt deal with the Skillz Game, how about that?? Last night was a fun night, as there was a Waffle's sighting (which is always a good thing), and some good play (and some not so good play). heffmike got his 5th win! Congratulations. 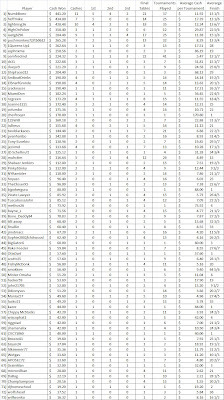 heffmike also takes over the Money leaderboard top spot, but there is still 3 months an plenty of chances for out top players to catch him. Can any of the top 5 (or all of them??) get over $500 by years end? Next Tuesday is 7 Card Stud Hi/Lo. Hope to see you all there! Hope to get a nice turn out for this tournament, Razz always seems to get more people than HOSE that was played last week. Will update soon on how I did over the weekend in my live tournament, lets just say I was very happy with how I played both nights!